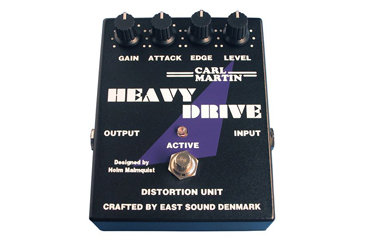 The Carl Martin Heavy Drive is a 9V-battery-powered pedal designed to emulate the sound of a high gain tube amp used by heavy rock musicians. It offers loads of gain, but responds to the guitarist's touch without altering the basic tone of the guitar. The Carl Martin Heavy Drive has enough gain on tap to lead you to Rectifier tone territory without low-string mush or raspy highs.